Star-crossed love, betrayal ... and climate change? Star-crossed love, sinister secrets, and betrayal … these are some of the tried-and-true themes of the Latin American telenovela. It’s a melodramatic – and often funny – genre similar to a soap opera. Irma Muñoz is the Founder of Mujeres de la Tierra, an environmental nonprofit in L.A. 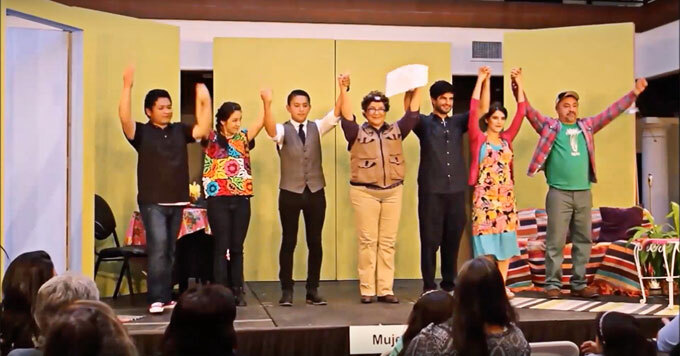 The organization created an amateur theater group called “Telenovelas in the Park.” The group performs plays that use these exaggerated dramas to teach audiences about environmental topics. The stories – performed in blended Spanish and English – feature the fictional Cabezón family. The stubborn father does not care about the earth but the grandmother does, passionately. The family’s conversations teach audiences about drought, water conservation, and plastic pollution. She says it’s important to develop culturally specific ways to connect with people – and entertain them in the process.